From its early 1918 history, St. Mary parish was a congregation of hard working immigrant Romanians. They joined together to pray and to keep their traditions alive and strong. Over the years, due to deaths and people relocating, the parish group became less then twenty families. In 1981, with the help of Fr. Matthew, and now with the present efforts of Fr. Paul, the parish began to grow again. The congregation, now more then three times it’s 1981 size, is a beautiful mixture of nationalities, predominantly of Eastern European cultures. A new family of people sharing many traditions and, most importantly, sharing a strong Catholic love of God. On Sept 15, 1918, under the direction of Rev. Pavel Craciun, it was decided to purchase the Methodist Church on 318 Stoner Ave. (later 26th St.) The parish was given the title, “St. Mary’s Romanian Greek Catholic Church.” The church was gradually remodeled for the Eastern Rite. In 1919 the parish was shepherded, for a few months, by Father Alexandru Serban. During this short period, the parish redecorated the church and paid a major portion of the mortgage debt. On May 25, 1919, the church was dedicated. Father Aurel Haţegan followed as administrator and on September 21, 1919, the parish was placed under the jurisdiction of the Catholic Diocese of Pittsburgh. After Father Hategan until 1927, the spiritual needs of our community were attended to by Father C. M. Pop-Lupu of Canton, Ohio. The first resident priest of our parish was Father Valer Huza, who, after serving our Church approximately two years, returned to his native Romania. From 1929 until 1954, with the exception of a year and a half during which time Father Victor Vamosiu served as visiting priest, our parish was administered by the late Father Spatariu of Youngstown, Ohio. Special recognition should be given Father John Spatariu, who although having a parish of his own in Youngstown, found time to commute between Youngstown and McKeesport thus enabling our people to assist in Mass at least twice a month. It was through his untiring efforts that repairs to the church were made and our small community was held together. During this time, on Sundays, weather permitting, the parishioners of St. Mary’s would gather for a picnic at the farm of a parishioner, Mrs. Sabu (between the Christy Park Veterans Memorial and the river). A band comprised of Louis Russ Sr. (string bass), Louis Russ Jr. (violin), George Siket (clarinet), Vasile Micklous (marimba). The band played, the people danced and sang and all enjoyed their home-made Romanian foods. In additional they also held an annual church picnic at Kossuth Park (across Rt. 48 from the current Olympia Shopping Center). In 1954 the leadership of the parish was entrusted to Father George Rus who arrived from Rome via Buenos Aires, Argentina. He later became a professor of scripture at the Saints Cyril and Methodius Byzantine Seminary on Perrysville Ave., Pittsburgh from 1959 until about 1965. Upon arriving Father Rus immediately adapted himself to the needs of the parish. Since the parish house was in need of immediate repairs, the members, under the leadership of Father Rus, contributed both money and labor and remodeled the interior of the parish house into a modern apartment. All the furnishings for the apartment including the rugs and drapes, were purchased by the women’s group, Reuniunea Mariana Bunavestire (The Annuciation of Mary). Noting a need for a garage, the members of the parish worked shoulder to shoulder again contributing money and labor to build the garage on the parish lot. Under the guidance of Father Rus, a four voice choir was organized thereby enhancing the solemnity of our Divine Liturgy. During this time a catechism school and a Romanian language class for the children were also organized. The spiritual life of the parish had been strengthened by the presence of two religious groups, the Reuniunea Mariana Bunavestire and the Holy Name Society. The Reuniunea Mariana Bunavestire was reorganized into a Sodality of 39 women. Although the main purpose was the spiritual goal of embracing the practice of Christian virtues, the Reuniunea also worked to aid the church in its material necessities among which were the care of the altar and a library. This library consisting of more than 200 volumes of books was at the disposal of all the faithful. The women divided themselves into cooking teams, each hosted a monthly parish dinner as a fund raiser for the church. The Holy Name Society was organized with 16 men with the intention of strengthening the religious life in the parish. The Bowling League, a branch of the Holy Name Society, provided an enjoyable form of recreation plus greatly contributing financially to the building fund. In 1955 it was ascertained that the foundation of the church needed to be strengthened. Plans for this project were approved by His Excellency John F. Dearden, Bishop of Pittsburgh. Since there existed a need of a hall for the meetings of the faithful, a decision was made to construct a hall under the church at the same time. Working by candlelight the men of this parish excavated the area beneath the church by hand. The cost of this project amounted to $25,000. Each family pledged the sum of $468 or more, payable in 3 years and at the end of a year and a half, the debt was paid. By August 1959, the remodeling of the interior and exterior of the church and the entire first floor of the parish house was completed for approximately $60,000. The dedication of the newly remodeled church took place on May 29, 1960. Because the community was very small and composed only of working people, they prayed that their sacrifices and contributions would, in the light of God, take on great proportions and bring with it corresponding graces. 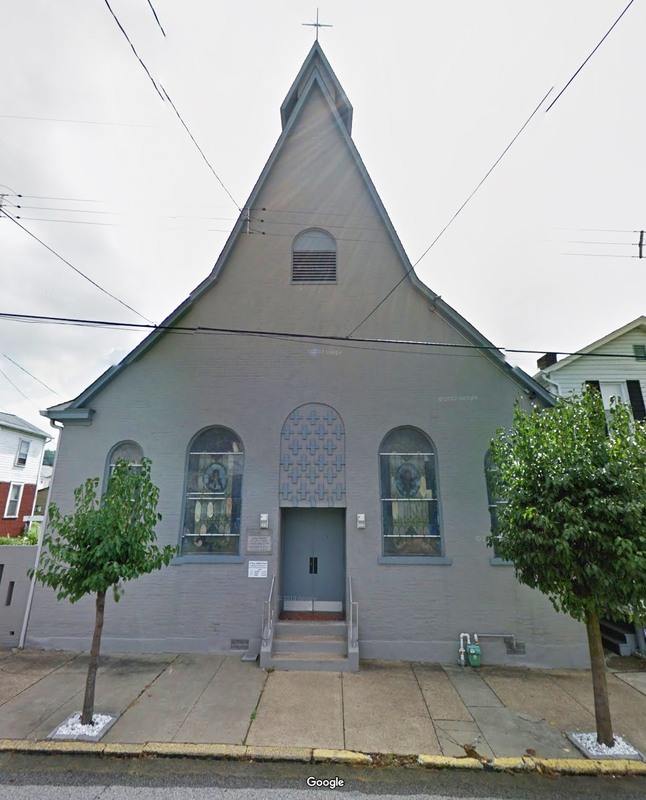 Due to the endless work of Father Rus and everyone concerned, by 1960 the Romanian Catholic community of McKeesport had a church of modern architecture and a parish house of which they could be justly proud. On one occasion, he also arranged to celebrate a Byzantine Liturgy in St. Paul Cathedral (Diocese of Pittsburgh) with St. Mary Choir singing and the bishop of Pittsburgh, His Eminence John Cardinal Wright, S.T.D., explaining the Liturgy to the congregation. On two occasions the choir was invited to sing at the Labor Day weekend Pilgrimage of the Basilian Sisters at Mount Saint Macrina in Uniontown, PA. In July, 1960, the first annual summer event of “International Village” (formerly called “Old Home Week”) began in downtown McKeesport. Many nationalities were eager to join in the fun. The Romanians of St. Mary Parish were among the first. The women spent long hours preparing food and pastries. The following year in August, 1961, the “Village” was moved to Renziehausen Park in McKeesport to provide room for the thousands who attended. In 1962, at the third annual “Village,” the Voice of America interviewed Fr. Rus and Charles Streza who stressed the right to speak your views in the language of your heritage and the importance of preserving culture and tradition. Twenty children of parishioners performed dances of the old country in authentic Romanian costumes made by their parents. A parade in downtown McKeesport preceded the start of the “The Village” for several years. In 1963, a Romanian hand crafted float designed by sisters Valeria and Marie (Killian), and decorated by the parishioners, paying tribute to the Romanian composer George Enesco, was entered into the parade. In 1970 a design contest was held to select the official symbol of the “International Village.” After a popular vote of the people a symbol was adopted, which is still in use today. The creator of the symbol was Marie (Killian) Race, a member of the parish. Marie was honored at the 2008 “Village” for her artistic contribution of the symbol. The next priest to serve the parish was Fr. John Matthew Elanjileth. Father Matthew has been an integral part of the social and religious fabric of the area for more than 30 years. Born in Kerala, India on April 26, 1921, Father Matt was ordained on August 24, 1945 by Benedictine Bishop Bernard Regno at the Papal Seminar in Candy, Ceylon. He was incardinated into the Diocese of Pittsburgh on October 29, 1976. He has served as parochial vicar at several diocesan parishes including St. Mary of Mercy in Downtown Pittsburgh, St. Lawrence O’Toole in Garfield, Madonna del Castello in Swissvale, St. Joseph in Coraopolis and St. Sylvester in Brentwood. Since 1981 he has served as chaplain to UPMC McKeesport where he offers Masses on Sundays and holydays. Father was assigned to St. Mary Romanian Church arriving on Wednesday, March 25, 1981, the Feast of the Annunciation of the Blessed Virgin Mary, whereupon he concelebrated a Divine Liturgy with Fr. Rus, who left for Detroit MI the next day. When Fr. Matthew first arrived, his parishioners wondered how he would follow in the steps of their previous Romanian pastors. But his love and humility, his devotion to his church and his personal holiness became obvious and the people knew they had been blessed with this pastor. Between 1981 and 2006 his service to the people helped the parish to once again grow in number. Fr. Matthew comforted the sick, the dying, the poor, the young and the old. He touched the lives of many. He spoke of always tending to our duties, which meant putting the need and wellbeing of everyone else before his own. Father Matthew initiated the Saturday evening liturgy, bringing St. Mary more in line with other area churches. These churches, of both Byzantine and Roman rites, know Father Matthew as the priest who comes to help whenever and wherever help is needed. In addition, he has offered Mass at Auberle for many years and continues to do so today. Father Matthew is a priest with a heart for the people he serves. St. Mary Romanian Catholic Church is proud and privileged to have been served by this humble and faithful servant of God. On December 4, 1982, the Romanian Catholic Exarchate was established by Pope John Paul II. On March 26, 1987, the Exarchate was elevated to the rank of an Eparchy (Diocese). St. Mary parish is now part of the Romanian Catholic Diocese of Canton Ohio. The Most Reverend Louis Puscas, D.D. became the first bishop of this new diocese. He retired as bishop on July 15, 1993. The current bishop, the Most Reverend John Michael Botean was ordained as bishop on August 24, 1996. In 2006 Fr. Matthew Elanjileth retired. As this elevated him to Pastor Emeritus, he was joined by Fr. Paul Voida, who was assigned as the new administrator of the parish. Fr. Paul was born in 1957 in the Los Angeles area, California. His parents, both first generation Americans of Romanian descent, were married in 1952 at St. Michael Romanian Catholic Church in Aurora Illinois. He graduated with a Bachelor of Music degree in violin performance in 1981 from Cal State University, Fullerton. Then for the next sixteen years he had various business careers and gradually became more involved in parish ministries in both Roman and Byzantine Catholic parishes. His mother, Elaine, was still alive when he entered the seminary and his father, Louis, lived to see him ordained. He entered the Byzantine Catholic Seminary of Ss. 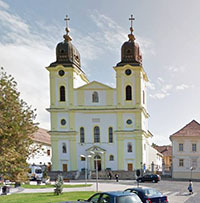 Cyril and Methodius, Pittsburgh, in September 1997 and completed the course of study in May of 2001.He made two trips to Romania, living there a total of nine months. He continued to serve at St. George Cathedral (of the Romanian Catholic Diocese) in Canton, Ohio, as the assistant to the Director of Religious Education until he was ordained to the priesthood on July 10, 2005 at Holy Cross Melkite Church in Placentia, Calif. by Bishop John Michael Botean. He was assigned to St. Mary parish in Christy Park, McKeesport, PA in May 2006. Fr. Matthew became the Pastor Emeritus concelebrating often with Fr. Paul during his first year at St. Mary’s. Fr. Paul started a Montessori children’s catechism program called Page 6 of 6 the Catechesis of the Good Shepherd in Nov. 2007 and also is starting an Adult Education program. The parish has had two annual picnics in its side garden in July 2007 and 2008. In the fall of 2007 it was decided that a celebration in tribute to Fr. Matthew was necessary. Fr. Paul and a parish committee organized, solicited tickets and hosted the Father Matthew Appreciation Dinner at the Youghiogheny Country Club, Elizabeth Township, on Sunday April 6, 2008. In honor of the 90th anniversary, Fr. Paul and Frances Flaherty produced the 2008 90th Anniversary Commemorative Book. Together, with the committee for the 90th Anniversary, they organized the event which was held in the hall of St. Patrick Roman Catholic Church in Christy Park, McKeesport on November 2, 2008. Fr. Paul is very happy at St. Mary Parish and is looking forward to building a parish community with a truly Catholic vision of life.